This example compares two survival distributions for the treatment effect. 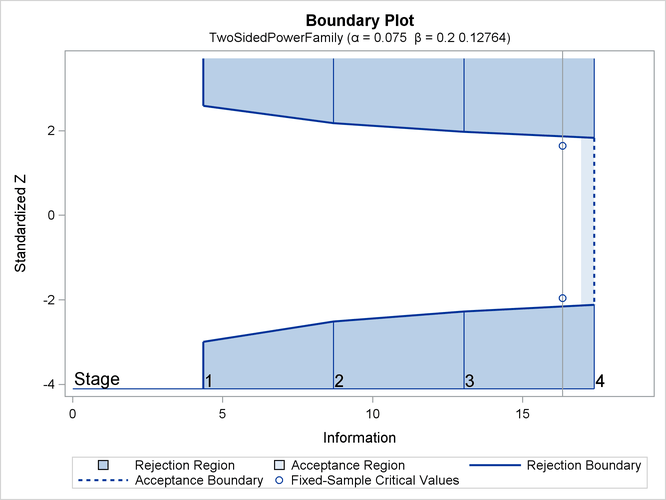 The example uses a power family method to generate two-sided asymmetric boundaries and then uses a proportional hazards regression model to test the hypothesis with a covariate. A clinic is conducting a clinical study for the effect of a new cancer treatment. The study consists of mice exposed to a carcinogen and randomized to either the control group or the treatment group. The event of interest is the death from cancer induced by the carcinogen, and the response is the time from randomization to death. where is an arbitrary and unspecified baseline hazard function, TrtGp is the grouping variable for the two groups, Wgt is the initial weight of the mice, and and are the regression parameters associated with the variables TrtGp and Wgt, respectively. The grouping variable has the value 0 for each mouse in the control group and the value 1 for each mouse in the treatment group. The hypothesis with an alternative hypothesis is used for the study. where is the variance of TrtGp and is the proportion of variance of TrtGp explained by the variable Wgt. If the two groups have the same number of mice in the study, then the MLE of the variance is . Further, if , then you can specify the MODEL=PHREG( XVARIANCE=0.25 XRSQUARE=0.10) option in the SAMPLESIZE statement in the SEQDESIGN procedure to compute the required number of events and the individual number of events at each stage. The following statements invoke the SEQDESIGN procedure and request a four-stage group sequential design for normally distributed data. The design uses a two-sided alternative hypothesis with early stopping to reject the null hypothesis . A power family method is used to derive the boundaries. The ALPHA=0.075(LOWER=0.025) option specifies a lower level 0.025 for the lower rejection boundary and an upper level for the upper rejection boundary. The geometric average hazard is used in the HAZARD= option in the SAMPLESIZE statement to compute the required sample size. The specified ACCRATE=10 option indicates that 10 mice will be accrued each week and the resulting minimum and maximum accrual times will be displayed. The "Design Information" table in Output 90.7.1 displays the design specifications and the derived statistics. The "Boundary Information" table in Output 90.7.2 displays the information level, alternative reference, and boundary values at each stage. By default (or equivalently if you specify BOUNDARYSCALE=STDZ), the procedure displays the output boundaries with the standardized Z statistic. With ODS Graphics enabled, a detailed boundary plot with the rejection and acceptance regions is displayed, as shown in Output 90.7.3. With the MODEL=PHREG option in the SAMPLESIZE statement, the "Sample Size Summary" table in Output 90.7.4 displays the parameters used in the sample size computation for the proportional hazards regression model. With a minimum accrual time of 7.73 weeks and maximum accrual time of 27.98 weeks, an accrual time of 20 weeks is used in the study. The "Numbers of Events" table in Output 90.7.5 displays the required numbers of events for the group sequential clinical trial. The ODS OUTPUT statement with the BOUNDARY=BND_TIME option creates an output data set named BND_TIME which contains the resulting boundary information for the subsequent sequential tests. With an accrual time of 20 weeks, the "Sample Size Summary" table in Output 90.7.6 displays the follow-up time for the trial. The "Numbers of Events and Sample Sizes" table in Output 90.7.7 displays the required sample sizes for the group sequential clinical trial. Thus, the study will perform three interim analyses after 14, 20, and 25 weeks and a final analysis after 31 weeks if the study does not stop at any of the interim analyses. Suppose 140 mice are available for the first interim analysis after week 14. Output 90.7.8 lists the first 10 observations in the data set weeks_1. 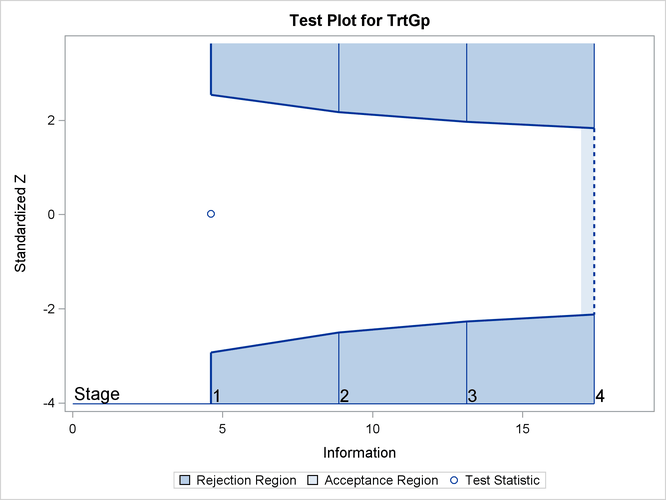 The TrtGp variable is a grouping variable with the value 0 for a mouse in the placebo control group and the value 1 for a mouse in the treatment group. The Weeks variable is the survival time variable measured in weeks and the Event variable is the censoring variable with the value 0 indicating censoring. That is, the values of Weeks are considered censored if the corresponding values of Event are 0; otherwise, they are considered as event times. The following statements create and display (in Output 90.7.9) the data set for the treatment effect MLE statistic and its associated standard error. Note that for a MLE statistic, the inverse of the variance of the statistic is the information. The BOUNDARY= option specifies the input data set that provides the boundary information for the trial at stage 1, which was generated in the SEQDESIGN procedure. The PARMS=PARMS_TIME1 option specifies the input data set PARMS_TIME1 that contains the test statistic and its associated standard error at stage 1, and the TESTVAR=TRTGP option identifies the test variable TRTGP in the data set. If the computed information level for stage 1 is not the same as the value provided in the BOUNDARY= data set, the INFOADJ=PROP option (which is the default) proportionally adjusts the information levels at future interim stages from the levels provided in the BOUNDARY= data set. The ORDER=LR option uses the LR ordering to derive the p-value, the unbiased median estimate, and the confidence limits for the regression slope estimate. The ODS OUTPUT statement with the TEST=TEST_TIME1 option creates an output data set named TEST_TIME1 which contains the updated boundary information for the test at stage 1. The data set also provides the boundary information that is needed for the group sequential test at the next stage. The "Design Information" table in Output 90.7.10 displays design specifications. By default (or equivalently if you specify BOUNDARYKEY=ALPHA), the boundary values are modified for the new information levels to maintain the Type I level. Since the computed information level at stage 1 is not the same as the value provided in the BOUNDARY= data set, the power has been modified. The "Test Information" table in Output 90.7.11 displays the boundary values for the test statistic with the MLE statistic scale. 0.5099 8.869192 -2.06428 2.06428 -2.50505 2.17290 . 0.7550 13.13104 -2.51175 2.51175 -2.27093 1.96941 . 1.0000 17.39288 -2.89077 2.89077 -2.11635 1.83531 . With the INFOADJ=PROP option (which is the default), the information levels at interim stages 2 and 3 are derived proportionally from the information levels in the BOUNDARY= data set. At stage 1, the standardized Z statistic 0.01795 is between the lower and upper boundary values of –2.92457 and 2.54086, so the trial continues to the next stage. Note that the observed information level 4.6073 corresponds to a proportion of 0.2649 in the information level. If the observed information level is much larger than the target proportion of 0.25, then you can decrease the accrual rate, accrual time, or follow-up time to achieve target information levels for subsequent stages. These modifications should be specified in the study plan before the study begins. With ODS Graphics enabled, a boundary plot with test statistics is displayed, as shown in Output 90.7.12. As expected, the test statistic is in the continuation region between the lower and upper boundary values. The BOUNDARY= option specifies the input data set that provides the boundary information for the trial at stage 2, which was generated by the SEQTEST procedure at the previous stage. The PARMS= option specifies the input data set that contains the test statistic and its associated standard error at stage 2, and the TESTVAR= option identifies the test variable in the data set. The ODS OUTPUT statement with the TEST=TEST_TIME2 option creates an output data set named TEST_TIME2 which contains the updated boundary information for the test at stage 2. The data set also provides the boundary information that is needed for the group sequential test at the next stage. The "Test Information" table in Output 90.7.13 displays the boundary values for the test statistic with the MLE statistic scale. At stage 2, the standardized Z statistic –0.43552 is between the lower and upper boundary values, –2.47689 and 2.14819, respectively, so the trial continues to the next stage. 0.7625 13.2629 -2.52433 2.52433 -2.26878 1.96770 . 1.0000 17.39288 -2.89077 2.89077 -2.12017 1.83880 . Since the data set PARMS_Time2 contains the test information only at stage 2, the information level at stage 1 in the TEST_Time1 data set is used to generate boundary values for the test. Similarly, the test statistic at stage 3 is also between its corresponding lower and upper boundary values. The trial continues to the next stage. The BOUNDARY= option specifies the input data set that provides the boundary information for the trial at stage 4, which was generated by the SEQTEST procedure at the previous stage. The PARMS= option specifies the input data set that contains the test statistic and its associated standard error at stage 4, and the TESTVAR= option identifies the test variable in the data set. The "Test Information" table in Output 90.7.15 displays the boundary values for the test statistic. The standardized test statistic –0.1857 is between the lower and upper boundary values of –2.10447 and 1.82112, respectively, so the study stops and accepts the null hypothesis. That is, there is no evidence of reduction in hazard rate for the new treatment. The "Test Plot" displays boundary values of the design and the test statistic at the first two stages, as shown in Output 90.7.16. It also shows that the test statistic is in the "Acceptance Region" between the lower and upper boundary values at stage 4. After the stopping of a trial, the "Parameter Estimates" table in Output 90.7.17 displays the stopping stage, parameter estimate, unbiased median estimate, confidence limits, and p-value under the null hypothesis . where is the observed test statistic at stage 4, is a standardized normal variate at stage k, and and are the stage k lower and upper rejection boundary values, respectively. where is the upper level and . Since , , which is greater than 0.50. Thus, the two-sided p-value is given by .